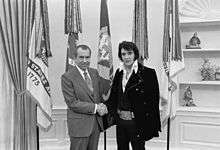 On the morning of December 21, 1970, actor-singer Elvis Presley shows up to the White House and requests an urgent meeting with President Richard Nixon. Presley opposes the drug culture, the hippie movement, SDS, and Black Panthers; he wants Nixon to swear him in as an undercover agent in the Bureau of Narcotics and Dangerous Drugs. On February 16, 1971, Nixon begins recording every meeting and phone call in the Oval Office. Nixon and Presley in the Oval Office on December 21, 1970. On November 5, 2014, it was announced that Kevin Spacey and Michael Shannon signed on to portray Richard Nixon and Elvis Presley respectively in a feature film entitled Elvis & Nixon, written by Joey Sagal, Hanala Sagal and Cary Elwes, about the pair's famous meeting at the White House in 1970. On November 11, Sony Pictures Worldwide Acquisitions brought the film to the market. On January 16, 2015, five actors joined the cast, including Colin Hanks, Johnny Knoxville, Alex Pettyfer, Tracy Letts and Sky Ferreira. Pettyfer plays Elvis' best friend Jerry Schilling, who goes to Washington, D.C. with him, Hanks plays Egil Krogh, lawyer and official of President's administration, Knoxville plays Elvis' head of security, while Ferreira plays Jerry's love interest. On February 4, four more cast members included Ashley Benson, Tate Donovan, Poppy Delevingne, and Dylan Penn. Benson plays an American Airlines worker, Donovan plays White House Chief of Staff H. R. Haldeman, Delevingne plays a stewardess flying with Elvis to D.C., while Penn would be playing a hotel worker. Principal photography began on January 12, 2015, in New Orleans, Louisiana. Filming also took place in Shreveport, Louisiana and Los Angeles, California. On November 11, 2014, it was announced that Sony Pictures Worldwide Acquisitions had acquired all distribution rights outside of the United States. On June 23, 2015, it was announced Amazon Studios had acquired the film for $4 million, the film marked their first official film acquisition. Bleecker Street will release the film theatrically prior to the film being released on Amazon. The film was presented at the 2016 Tribeca Film Festival in March 2016. The film was released in the United States on April 22, 2016, 22 years to the day of Nixon's death. The film was released in the United Kingdom on April 29, 2016. On Rotten Tomatoes the film has a rating of 77% based on 121 reviews and an average rating of 6.5/10. The site's critical consensus reads, "Elvis & Nixon may not do much to expand on its absurdly iconic photographic source material, but it's rarely less than engaging thanks to its talented starring duo." On Metacritic, the film has a score of 59 out of 100 based on 37 reviews, indicating "mixed or average reviews". Radio Times gave the film an average review but praised the acting: "Michael Shannon is an enjoyably left-field choice for a jaded, increasingly alienated Presley; he’s grown weary of the persona he has to tiresomely maintain, seems to be losing the plot, and yet still creates a stir wherever he treads. Assigned less screen time, Nixon is a more enigmatic figure: gruff, stubborn and played to perfection by Kevin Spacey. ... Shannon and Spacey are a hoot in an entertaining if unenlightening effort". Flickering Myth enjoyed the film: “Elvis & Nixon is an entirely pleasant 86 minutes in the cinema – entertaining, humorous and well-made, albeit somewhat forgettable. Also it’s further proof that a female director can harness the energy of two top male thespians portraying macho men.” What's Worth Seeing also liked the film, writing: "With Michael Shannon as the gun-toting rock-and-roll star and Kevin Spacey as the President, more famous for his downfall a couple of years ahead, director Liza Johnson delivers an unexpectedly sharp, funny and zippy real-life tale of absurdity which would have been surreal beyond measure for everyone involved – except for The King himself." Nigel M. Smith of The Guardian called the film “a breezy comedy nimbly directed” and wrote: "Given that the film is about two of the most recognizable figures of the 20th century, clearly casting is key to its success. Luckily, Johnson hit the jackpot by getting Michael Shannon on board as the King and Kevin Spacey to play the corrupt president." ↑ "ELVIS & NIXON (15)". British Board of Film Classification. March 22, 2016. Retrieved March 22, 2016. ↑ "ELVIS & NIXON Analysis". DreameGGs Funding Club. Retrieved September 7, 2016. ↑ "Elvis & Nixon (2016)". Box Office Mojo. Retrieved September 7, 2016. ↑ Goldberg, Matt (January 8, 2016). "Elvis & Nixon' Trailer Has Michael Shannon and Kevin Spacey Hiding Guns and Slapping Knuckles". Collider.com. Retrieved January 8, 2016. 1 2 Yamato, Jen (November 5, 2014). "'Elvis & Nixon' Sets Kevin Spacey & Michael Shannon In Tale Of Historic White House Hangout – AFM". Deadline. Retrieved January 20, 2015. ↑ McClintock, Pamela; Ford, Rebecca (February 4, 2015). "Berlin: See Kevin Spacey as Nixon in First 'Elvis & Nixon' Photo (Exclusive)". hollywoodreporter.com. Retrieved March 4, 2015. ↑ McNary, Dave (November 11, 2014). "AFM: Kevin Spacey-Michael Shannon's 'Elvis and Nixon' Bought in Key Markets by Sony". Variety. Retrieved January 20, 2015. 1 2 Reilly, Travis (January 16, 2015). "Colin Hanks, Johnny Knoxville, Alex Pettyfer Added to 'Elvis & Nixon'". The Wrap. Retrieved February 6, 2015. 1 2 Kit, Borys (February 4, 2015). "'Pretty Little Liars' Star Ashley Benson Joins Kevin Spacey in 'Elvis & Nixon' (Exclusive)". The Hollywood Reporter. Retrieved February 10, 2015. ↑ "On the Set for 1/19/15: Kevin Spacey Starrer Elvis & Nixon Begins Shooting, Director Joel Edgerton Starts on Blumhouse Film & More". SSN Insider. January 19, 2015. Retrieved January 20, 2015. ↑ "January 12, Louisiana Entertainment Jobs Hotline". Celtic Media Centre. January 12, 2015. Retrieved January 20, 2015. ↑ McGuire, Jordan (February 5, 2015). "FIRST LOOK: 'Elvis & Nixon'". Scene Magazine. ↑ Debruge, Peter (2016-03-29). "Tribeca Film Review: 'Elvis & Nixon'". Variety.com. Retrieved 2016-04-29. ↑ Hunter, Craig (January 8, 2016). 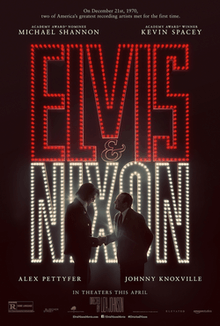 "First ELVIS & NIXON Poster Teases The Meeting Of The King & The Crook". ScreenRelish.com. Retrieved January 8, 2016. ↑ "Elvis & Nixon (2016)". Rotten Tomatoes. Retrieved May 9, 2016. ↑ "Elvis & Nixon reviews". Metacritic. Retrieved April 24, 2016. ↑ Emma Simmonds. "Elvis & Nixon review: "an entertaining if unenlightening effort"". RadioTimes. Retrieved 16 June 2016. ↑ Sara Hemrajani. "Movie Review – Elvis & Nixon (2016)". Flickering Myth. Retrieved 16 June 2016. ↑ Jason, Korsner (15 June 2016). "Elvis & Nixon – Competition". Elvis & Nixon - Competition. What's Worth Seeing. ↑ Nigel M Smith. "Elvis & Nixon review: Michael Shannon resurrects the King". The Guardian. Retrieved 16 June 2016.